It’s just breath-taking when you catch a flash of the Kingfishers with their superb bright blue and orange wings, we hope you are one of the lucky ones that spot them. Kingfishers usually hunt from an exposed perch and nest in the banks on the sides of the lakes, or in holes in trees, so keep your eyes peeled. There are also plenty of deer around our fields, your best chance of seeing these enchanting creatures is at dawn or dusk. You may see them drinking at the water’s edge in the morning; although they’re very nervous so it may only be the flash of their white tails you see as they dash off at full pelt. We’re surrounded by countryside views and areas to roam, there are plenty of bridle path routes crossing the farm and the opportunities for nature spotting are endless. The lakes on site were originally excavated for gravel back in the early 1940s, then again in the 1970s and afterwards were stocked with fish. People have fished for pike, perch, tench, roach and the elusive carp out of them ever since. You can try your hand at fishing to see what you can find – don’t forget to look out for the magical Kingfishers! 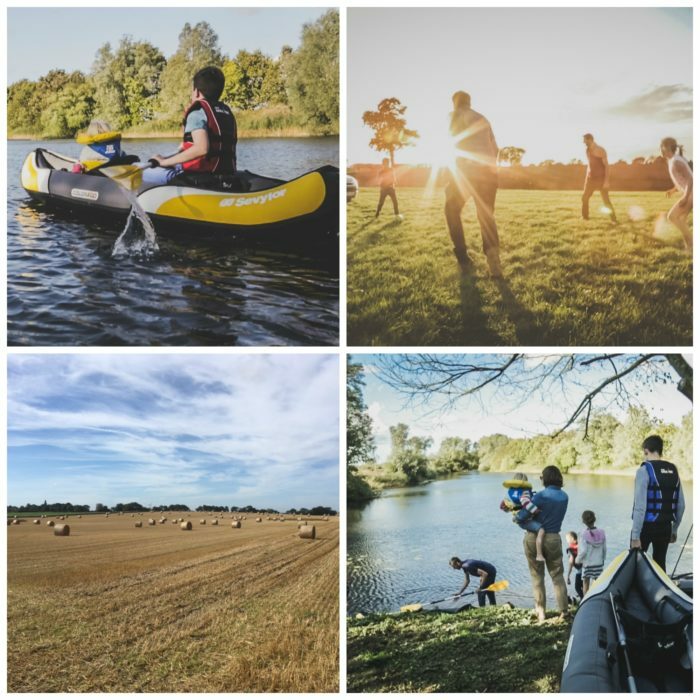 Kayaking on one of our tranquil lakes and being at duck-eye level fills your brain with happy, relaxing hormones; there’s just nothing better, it’s definitely our favourite family activity when we get chance. Fishing and Kayaking equipment is available for hire – contact us to find out more.